Brownsover Hall is purportedly haunted by a member of the Broughton-Leigh family. During the reign of Elizabeth it is understood that he had his hand severed. Supposedly 12 clergymen set about exorcising his ghost in 1755. Despite all their attempts, the ghost of “one-handed Broughton” reportedly ,still roams around the grounds and empty tower during the night,moaning and groaning. It is believed Broughton is still searching for a bottle containing his long lost spirit, which is said to be buried in the grounds . A famous previous owner of the estate, was non other than ,Frank Whittle the inventor of the jet engine. If you want to experience this hotel please check out the link for availability and more information about this Hotel. Coombe Abbey is now a spectacular hotel and country park .The Hotel is set in 500 acres of parkland, overlooking a tranquil lake and formal gardens. 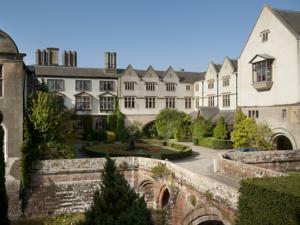 The Hotel was originally a 12th Century Cistern abbey which has been restored to its original standards. There are tales of ghostly sightings in the surrounding grounds and buildings. These are believed to be spirits of mysterious ghostly monks, and phantom horseman. Even a mysterious apparition of a Victorian woman has been seen riding her bike in adjacent roads. Probably one of the most famous tales is that of Abbott Geoffrey, who in 1345 was brutally murdered at the Abbey. The murderer was never caught and some say this was the led to the downfall of the Abbey. A few visitors have reported seeing a restless spirit in the kitchens and grounds. Then there are the footsteps of a supposed young gypsy girl tip tapping across the stable cobbles. Some think the tower at Coombe Abbey is haunted by Matilda, a pregnant maid. Ettington Park Hotel, is an imposing Victorian mansion in Alderminster. The beautiful exterior is neo-gothic in appearance , and can be seen in the classic ghost film, ‘The Haunting`. Guests and staff have reportedly seen a female ghost ,who they call ‘Lady Emma`. She has been sighted swishing herself across the terrace and then disappearing straight through the wall. Whilst tucked up in bed, some guest’s report the feeling of a strange sensations on their face. They have the distinct feeling, that someone is stroking linen across their face and hair. Could it be Lady Emma, just having a little fun? The building looks the part of a haunted mansion, is this where you want to stay the night? For more information about this Hotel and availability, please check out the link. ghostly lady visitor. According to village legend, the woman drowned as she became trapped beneath the water mill wheel. To this day, it is reported that her ghostly image can sometimes be glimpsed in and around the building. Mill. A very old mummified cat was found. Was it that of a witch or just a way to keep away the mice? The cat’s remains have supposedly been removed a number of times. Local folklore declares that this will bring bad luck to those who reside in the Mill. Good luck will not return until the cat is returned. Luckily the last attempt to remove the mummy, was back in 1999. To sample the delights of this riverside Hotel please check out the link for availability and more information about this Hotel. I worked at Walton Hall in Wellesbourne in 1990 as part of the maintenance team not long after Graham Maynard had left. Although i never experience anything by day at night on w/ends i had to take my turn every 4th w/end to do 12hr shifts cause of new guest’s coming and leaving this included night shift. The reception back then was in the main house i have never witnessed anything visually but would often hear unexplainable noises and have heard what sounded like children running along the corridors and would investigate and there would be nobody there this all happened above reception in the main house only. Where Main Reception is now i suspect from pictures is the old orchard mews on the location of the old stables as far as i know and i would often feel very uneasy in there even in the daytime. Also the main courtyard there used to be sounds of horses moving around from their horse shoes on stone although i never witnessed this personally other staff members had told me hope this has given you a bit more info and details.